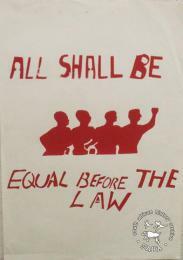 SAHA - South African History Archive - All shall be equal before the law. Title: All shall be equal before the law. Description: This poster is silkscreened red and white, issued by the Screen Training Project (STP), Johannesburg, for the Freedom Charter campaign in 1985. This poster refers to the fifth demand of the Freedom Charter. 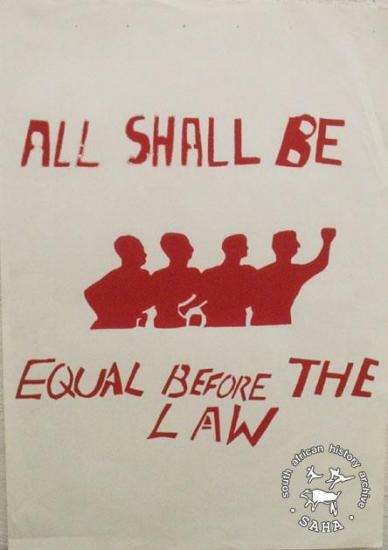 The text reads “All shall be equal before the law.”Digitised by Specialised Archival Solutions in 2009. Reproduced in "Images of Defiance: South African Resistance posters in the 1980s" on page 26 (number 32) of the 1991 SAHA / Ravan Press edition and the 2004 SAHA / STE Publishers edition. It also appears in SAHA's online edition of the book and in the virtual exhibition 'Tracing the unbreakable thread: non-racialism in South Africa'.